Boys stand in formation before walking into Assembly, as they have for 110 years! Ahh, Sunday at Camp. It’s mellow. Most alumni will tell you Sunday at Camp Highlands means three things. Assembly, Turkey Dinner and Sing. 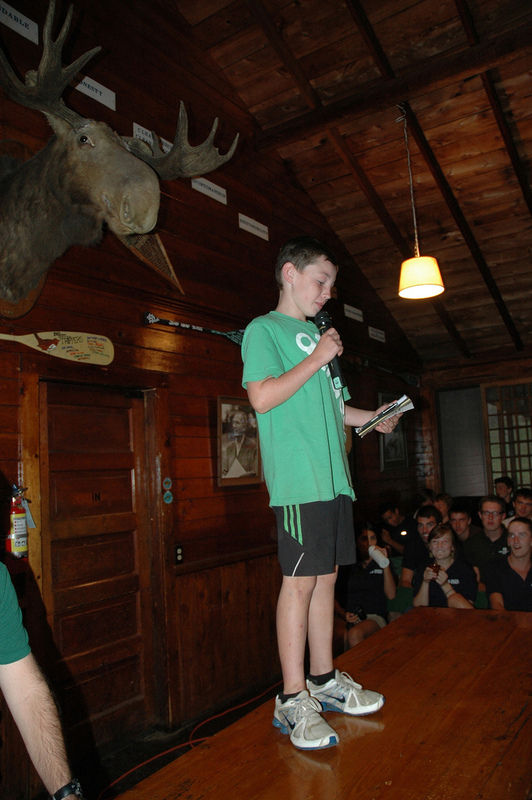 Let’s start with Sunday Assembly, which is a quiet time lasting about 45 minutes where staff and campers offer reflections on what it means to be a Highlands guy, which is to say, a Worthwhile Man. Today’s Assembly was great (I’m probably biased, since it was headed up by Andy Bachmann). He told stories about being a camper and the ways that he learned to live the “I’m Third” philosophy, not by walking around saying “I’m Third” all the time, but instead by modeling his behavior on older campers and staff members that took the time to mentor him when he was a camper. He described his days back in cabin 25, when John Burnside took little Andy Bachmann under his wing. He’d invite him to go sailing with him, he’d invite him to be his buddy at free swim. And most importantly he’d let Andy twist his arm as he’d do an arm flip. (PS he probably had jeans like that guy, too)! Andy said he felt important because John was big and cool. And then he told about how he modeled that behavior when little Martin Miller first came to camp, by inviting him to be his buddy at swim and by inviting him to go sailing with him. Couple all that the most gorgeous weather today, Turkey dinner and Sunday Night Sing, and you’ve got a recipe for general awesomeness. I’m feeling incredibly lucky to be here today. I know these boys are feeling that magic, too. It’s catching! We posted a little Facebook gallery yesterday titled, “What did YOU do today?” I tell you, these guys just GO here at Camp Highlands. And today’s no exception. It’s all in a day’s work. Colts are off on their canoe trip today! Juniors are in Eagle River playing laser tag, Cubs are on their overnight on a local lake and Colts took off this morning for their three-day canoe trip on an area chain of lakes. My 11 year old son is out with those guys, and I have to tell you, they were psyched! My desk: where paper comes to die. We’ve had a quiet day in the office trying to catch up on everything. 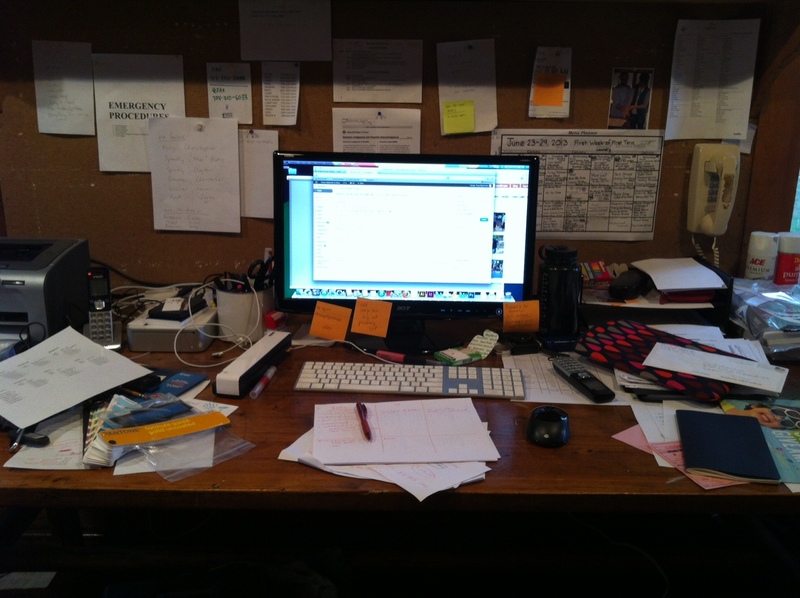 You should see my desk. It’s like a cyclone swept through. We’re posting photos and updating the social media outlets as much as we can – time to shut it down for the day! Enjoy! I’m telling you, this weather is incredible. It’s the perfect way to start out a summer camping season. Warm, breezy (no bugs), sunny. Just awesome. I’ve seen boys sailing, playing tennis and soccer, skiing, kayaking, canoeing, swimming, shooting hoops – and that was just on the walk from my cottage to the office! I’d say summer 2013 has come roaring in! According to Lois, your boys ate 784 chicken tenders and over ten pounds of rice for lunch today, and they’ll have soup and sandwiches for supper. I can hear the boys lining up for the store right now, and I just heard the swim bugle blow. I wish you could see and hear this. Happy boys, running and playing. It’s a sight to see. Over the next few days they’ll be getting to know their cabin mates and their counselors. They’ll be stepping out of their comfort zones in one way or another. Even the older professional campers might be bunking with someone they aren’t crazy about, and guess what? They’ll learn to persevere and figure out how to manage. Some boys might realize that when you are really hungry, there is NOTHING better than meatloaf, and it’s so weird, because they thought they hated meatloaf. It’s the magic of camp, really. Remember, we are already posting photos to the gallery. We sent you the password in the email earlier this week, or email me and I can give it to you. We do our best to get everyone up there! Keep checking the blog for updates, and if you haven’t liked us on Facebook, you’re missing out. (Check out the picture of the moon from last night!) I’ll email the cabin lists to you guys in the next couple days, in case you want to check out where your son ended up. And if you are on the Twitters, we are there too, posting random “overheard at camp” quotes and other nonsense. We’ll try and keep you in the know! When you start to feel blue, imagine you boy doing this! Tomorrow’s the big day. I know this because I got a calendar reminder today on my computer: “Boys arrive tomorrow.” Gee, thanks, I hadn’t noticed. While we here at CH HQ are getting ready to say hello to those boys, you are getting ready to say farewell. 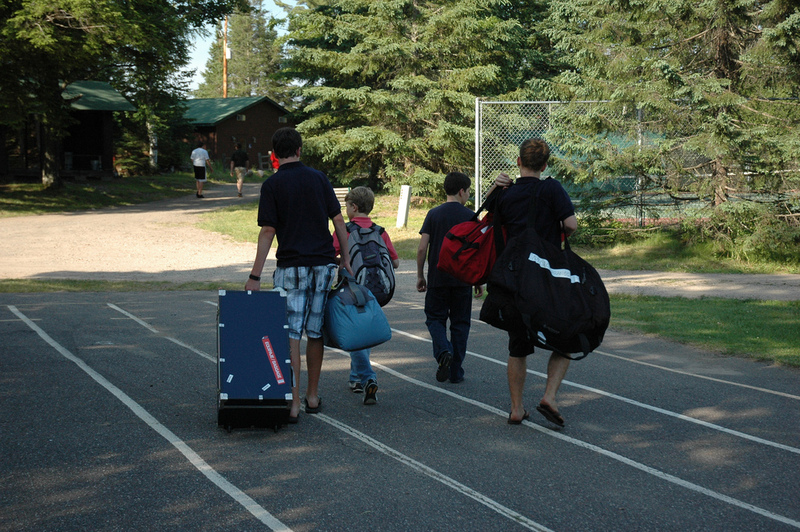 Here are some thoughts we have on saying good bye when you send your child to camp. Tomorrow. 1. Recognize that you will be as emotional, if not more, than your son. Being intuitive little creatures, they will pick up on your emotions. It’s important to be positive, even if you are feeling unsure and weepy. Crying or over-worry will undermine his confidence. Remind him that he *can do this*! Remind him you are just a letter away and that you love him and *believe* in him. Tell him you are excited for the experiences he’s going to have. Or imagine him doing this! 2. If you haven’t already discussed homesickness with him by now, go ahead and have that conversation. Tell him missing home is natural, and that you’d be sad if he didn’t miss you. Tell him to talk to his counselor if he’s feeling blue. Remind him that you aren’t going anywhere and you’ll be there at the end with open arms dying to hear all the, as one parent emailed me today said, “the usual amusing, heroic, enlightening, and eyebrow raising stories that the boys come home with.” (Remember we are well-versed in helping boys work through homesickness.) If you have any doubt, check out Michael Thompson’s book, Homesick and Happy. It’s GREAT. Also, I recently spoke with Michael Thompson on summer camp and these issues, and it’s available on podcast. 3. Keep it short and sweet. Make a plan ahead of time, so that there’s no surprise at 2:00 p.m. when you say, “OK buddy, we’re headed home.” If you’re taking the bus: Arrive at 9:15 – 9:30 a.m., check in with the counselor on duty at the bus, help your boy load his stuff on the bus. Make sure you’ve communicated any last minute instructions to the counselor and hang out until they move the boys on to the bus. Give him a big hug! Wave! Pat yourself on the back for keeping a stiff upper lip! If you’re dropping him off at camp, tell him the plan. “First we’ll check in. Then we’ll make your bed. I’d like a tour of camp, and once we check in with the nurse, I’ll walk you back to your cabin and give you a hug from there.” Everyone likes to know what’s happening next (believe me, I have a two-year old, I know what I’m talking about). Knowing what comes next helps set him up for a confident start. That’s it! Positive attitude, preparation and a plan. With those three things, that goodbye will be sweet and relatively painless. We’ll Facebook it when the busses arrive and camp is fully underway. If your son is flying in, you’ll get a phone call from the counselor when they arrive. I just wanted to introduce myself and let you know a few things about communication at Camp. My name is Tracy Bachmann. I’m Andy’s wife and Mike and Sharon’s daughter-in-law (not to mention Judah, Stella and Remy’s mom). I am the person that you will be hearing from when you read our daily blog during camp. As a mom, I understand how important it is to feel connected! I’m in the office every day answering the phone, shepherding emails and making Camp Facebook updates. Communication is my passion! I’m also wearing the new hat of database wrangler (yippee kai yay), and I’m still learning the ins and outs of this great system. 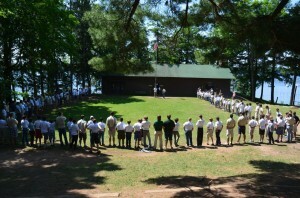 Please bear with us as we live through our first summer with CampMinder. • Sign in to the gallery on the website. We upload photos often. We try our best to get as many faces as possible on there, if you don’t see your child don’t worry. • Follow us on Twitter @CampHighlands and on Instagram too! (ok, full disclosure, I even have several Highlands Pinterest boards! P.S. I’ll be sending my 8 year old, Stella Plum, off to four weeks of camp in July. I completely understand the mix of excitement and apprehension about shipping a child off to camp. So, seriously, if you’re worried, please call me! I can run recon for you and let you know how that boy of yours is doing! I have been re-reading the comments from the parent response forms that we sent out at the end of last summer. Those comments help us know that we are on the right track. Your son will learn much while he is here– learning to take responsibility – learning to put his energy to the good — and learning what it means to be a Worthwhile man. I am writing to assure you that your son will be in good hands! We have an absolutely wonderful staff! We can assure you of that, because we know them. Our staff is an amazing blend of teachers and college students. Our main criterion in staffing is selecting “nice people.” Your son will have a ball! Make sure you are ready for camp! We are happy that your son is going to be with us at Camp Highlands this summer. You will want to make sure you’ve read all the information about travel to camp, mail, the email system and more. Please don’t hesitate to give us a call with any questions. Mail: Please write your son frequently. He will check the mail every day! 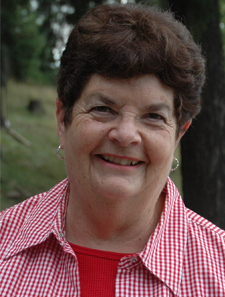 The summer address is: “your son’s name” c/o Camp Highlands, 8450 Camp Highlands Road, Sayner, WI 54560. If you’d like your son to write you, we strongly suggest sending him with pre-addressed, pre-stamped envelopes. E-mail: We utilize the services of Bunk1 for e-mails. They coordinate the notes so we receive them in an organized manner. You can download the Bunk1 information on the homepage. We even have the instructions in Spanish! There is a link on the homepage called “email your camper.” Once you’ve set up your Bunk1 account, this is the link you can click to access the Bunk1 portal. Packages: We encourage packages, but we ask that you NOT send food – even the healthy stuff. Packages are opened in the office, and edibles will have to be confiscated (and will not be saved until the end of camp). The four-legged critters can clean out a cabin in no time. Books, magazines, games, and puzzles are always popular. PRIORITY MAIL, UPS, DHL, and FED EX deliver right to camp. 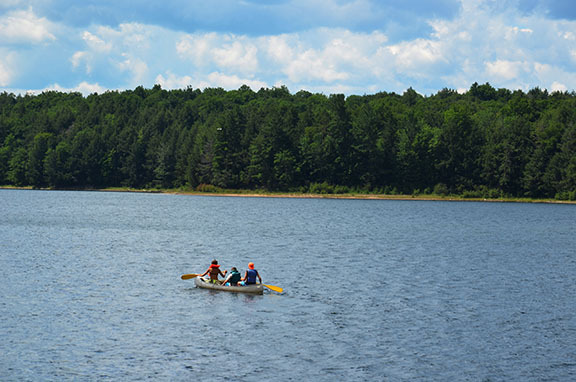 Telephone: The camp office telephone number is 715-542-3443. The best time to reach us is between 9:00 and 12:00 in the morning. The answering machine is always on, and we promise to get back to you if we are out when you call. We do not allow the campers to receive or make phone calls. It’s an interruption of life at camp and has a way of bringing on homesickness! Please don’t send cell phones, unless you want one for your son’s travel (remember to include the charger). We will keep the phone in the office until it is time for him to go home. 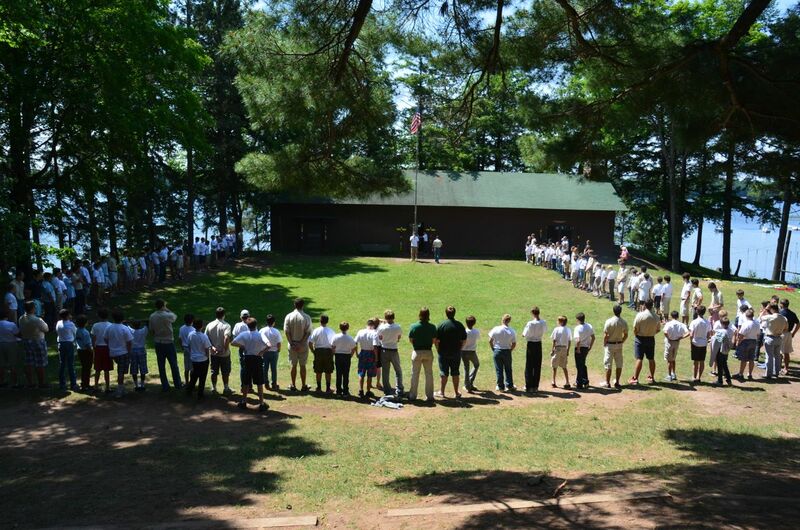 The Lodge: If you plan to come to gather your son at the close of his session, or visit camp during the summer, consider staying in the Highlands Lodge. It features seven guest cottages and a separate dining facility. The Lodge cabins all focus on the lake and maintain their rustic northwoods charm. This is a convenient and fun way to visit camp! To make your reservation, email Sharon or call her at 715-542-2950. 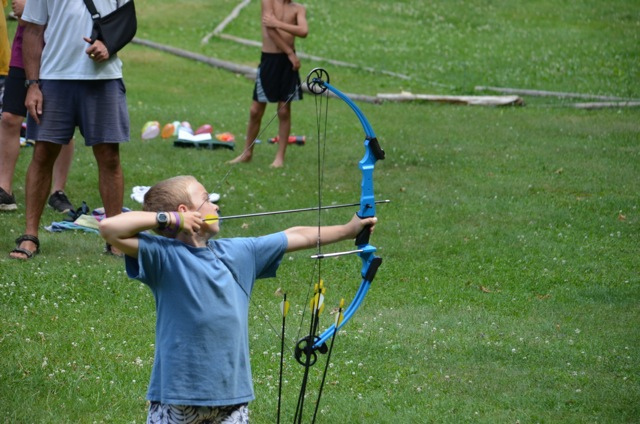 Friends + Family Camp: August 11 to 18, we offer a fun vacation where the parents get to play too! Each family has an individual cabin. The meals are great, and it is a lot of fun. Contact Sharon to enroll. Concerns: Please know that when you have a concern about your son; we want you to call or email us. You may read something “between the lines” in a letter and worry about it for a week before calling. Nine times out of ten it is something we can check on and clear up immediately – giving you a better night’s sleep! We do not consider your calls to us a bother. 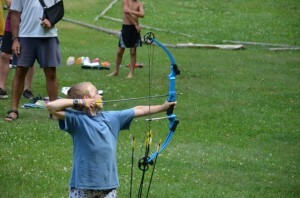 They are one way you can assist us in helping your son have the best possible time at camp. • Please have your son at the O’Hare Oasis by 9:15 a.m. so that we can be on time for our 10 a.m. departure. This is a link to a Google map showing the location of the Oasis. • The best time to arrive is 1:00 – 3:00 p.m on Sunday. Forms: A special thank you to all the parents who got all those forms completed! Thank you!! And thanks for bearing with us as we experience our first summer using this new database system! 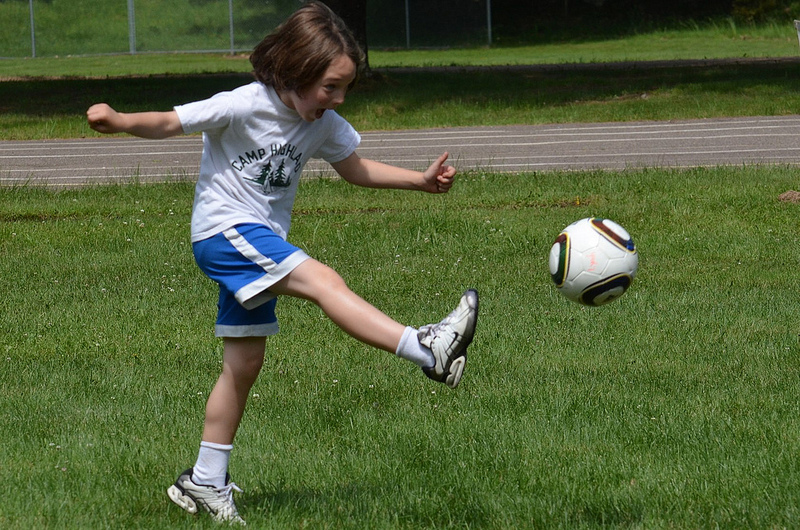 Sooooo many good questions about your kid's first time at summer camp! So it’s the first summer your son is packing up his ball glove and sleeping bag and headed off to camp. It seems like it would be so easy – boys, cabins, nature. But then you start worrying about the weather, the trip up, the trip home. It’s a lot! I’ll tell you what one of my amazing midwives told me when I had my first child. “Trust in the process.” We’ve been at this for 110 years! If you forget to pack something, it’s NOT a big deal. (Honestly, there’s Amazon Prime now!) And anyway, we probably have it in the store. Trunks, duffles and back packs, oh my – just pack it up however you see fit. Q. My daughter’s camp asks that we ship the bedding in the trunks and bring the clothes in the bags. You say differently but I wanted to make sure I have that correct. Does your staff make the kids beds, or do the campers? A. Don’t worry how you pack it. Just get it here! We do recommend putting clothes in the trunk and bedding in the duffel, but it’s really however you can fit it all in. The counselors make the beds for the little guys and they help the bigger guys make their beds when they arrive. I prefer to pack my kid’s clothes in the trunk so that they don’t need to repack when they get to camp. But honestly, it doesn’t really matter. Q. Do boys ever bring e-readers? Books are kind of like friends to my son and he’s really nervous about camp. Q. Do we need to pack mosquito netting for his bunk? A. We provide the mosquito netting or “dinglebats” (as we call them). Make sure you pack a bottle of DEET bug spray. We are hoping the dragonflies and bats will do their job before the campers get here, but we’ve had a very wet spring and the skeeters are pretty thick right now. Q. Do boys his age (nine) bring blankets/stuffed animals, etc? He has a special blanket that he sleeps with EVERY night but he thinks the other boys will laugh at him. A. Absolutely. My 11 year old still sleeps with his (grungy) blanket at camp. Q. For a nervous camper, what time do you recommend arriving? Will we have time to tour around or should I drop him and go? You tell me what’s best so I can prepare him…he does better knowing these things in advance. A. If I were you, I’d arrive after lunch – around 1 p.m. is perfect. Meet his counselor and the nurse, tour camp and then quickly and assuredly say good bye. I’d aim to head out of camp around 3:00 p.m. or so. That way there won’t be too much down-time before the buses with the rest of the campers arrive around 5:00 and camp really gets underway with spaghetti dinner at 6:00 p.m.
Q. I wanted to clarify how pick-up works. I understand there is a banquet. Is it on Friday or Saturday? Do some people go to the banquet and spend the night there and then leave the next day? Speeches at the final banquet are always great! A. The banquet is on FRIDAY at the end of camp. Festivities start at 3 pm, a picnic supper is at 6 pm, followed by awards, etc. The evening ends around 8:45. Depending on your travel plans, your son can go home with you after the banquet OR they can spend the night and be picked up by 9 a.m. on Saturday. Q. His birthday will be during camp. Do you celebrate birthdays? A. Do we ever! They get recognized at breakfast with a birthday button (like Disney World!) 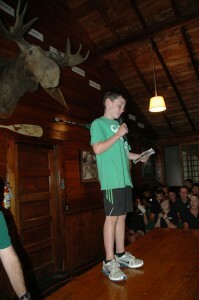 and their cabin gets their own special birthday cake a lunch, and of course all of camp sings happy birthday to him! It’s pretty great. So, I know there are LOTS more questions, and maybe you old professional camp parents have two cents you’d like to thrown in here? Just put them in the comments section and we can start answering! Or you can send me an email, or give me a jingle here at Camp. We are looking forward to an amazing summer! Q. Do you have a visiting day? A. Parents are invited to come at any time to camp. However, we suggest keeping the visits brief. You are welcome to make a reservation in the Lodge (call 715-542-2950 and talk to Sharon), or stay in one of the area’s accomodations. We also recommend that if your son may be wrestling with homesickness, a visit can actually make things worse, not better. If you do visit, we ask that you are a “fly on the wall.” Free time is a good time to spend time together. Having parents join in activities is disruptive to the boy’s experience. Q. May we call our son during camp? A. We have a very strict policy of no phone calls at camp. The exception is if it’s your son’s birthday. This applies to all of our campers, including international campers. Phone calls home are difficult for office staff to arrange, as we have only one line at camp. We also believe that a phone call home can induce homesickness, something that no parent wants to do. Thank you for respecting this policy!